The non-TV story at CES was all about the Internet of Things, whether it was wearables or smart homes/cars. There were hundreds of new products on display, but few of them seemed to actually solve any real problems and in some cases would seem to create them. Unfortunately, much of what I saw on display did not reach that level of utility. And every exhibitor seemed to gloss over the dirty little secret of the Internet of Things: In order for it to work, you’ve got to buy new things. You can’t retrofit your existing stuff. So while it’s great that a smart home app can tell your oven to start roasting a chicken, you’re going to have to buy a whole new stove in order to do that. Ditto blinds that raise and lower themselves according to the position of the sun: great idea, but do you really want to refit your house with new window treatments? 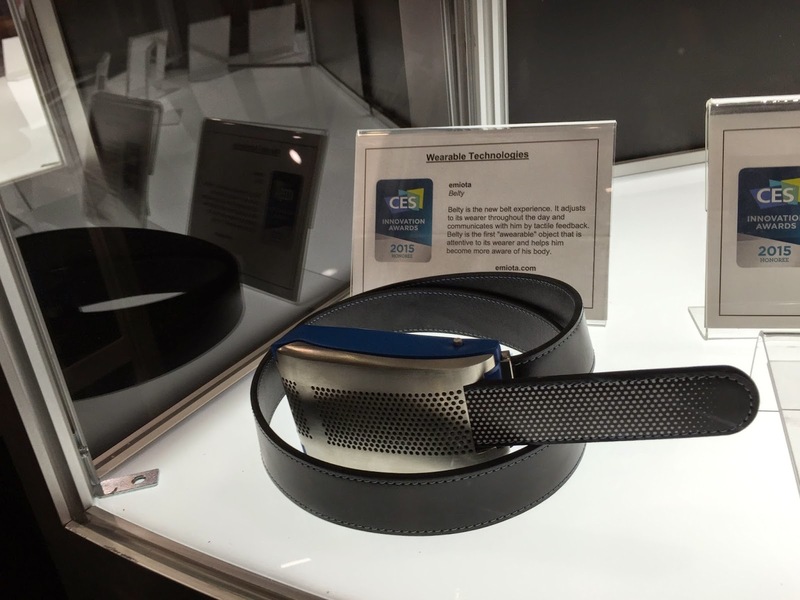 Take Belty, the smart belt, for instance, winner of a CES Innovation Award. In addition to serving as a fitness tracker, it loosens and tightens itself as you (over)eat and then digest. Is this really a problem for people? Maybe I’m just a light eater, but the occasional Thanksgiving meal aside, I just don’t ever find myself wishing my belt was looser. Ditto the “smart jar,” which helps you keep a running inventory of what’s in your pantry and whether you need to refill anything. A task I currently accomplish by opening a cabinet door and looking. Volkswagen’s touch gestures seemed to fall in the category of creating problems. They claim that they are eliminating buttons and replacing them with hand gestures. Which looks sort of cool at a trade show, but would seem to cause problems in real life. For example, you open the sunroof by waving your hand near the roof of the car in a front-to-back swiping motion. (The opposite motion closes it.) Think of how many times people are going to be gesturing with their hands and have the sunroof fly open. Think too of how many people are not going to swipe hard enough or far enough as a sudden rain shower is drenching them. That same VW concept car has a bar that runs along the dashboard. Swipe it with one finger to control the music, two fingers to control the navigation system, three fingers for something else. Think anybody’s actually going to remember that? My final beef are the large tablet-sized control panels many car manufacturers were showing off. (Tesla’s was the size of two tablets.) They just seem dangerous. Drivers don’t need to be reading all that and the lack of a physical button makes the no-look push that much more difficult. On the other hand, that may not be a problem if things like self-driving cars take off. 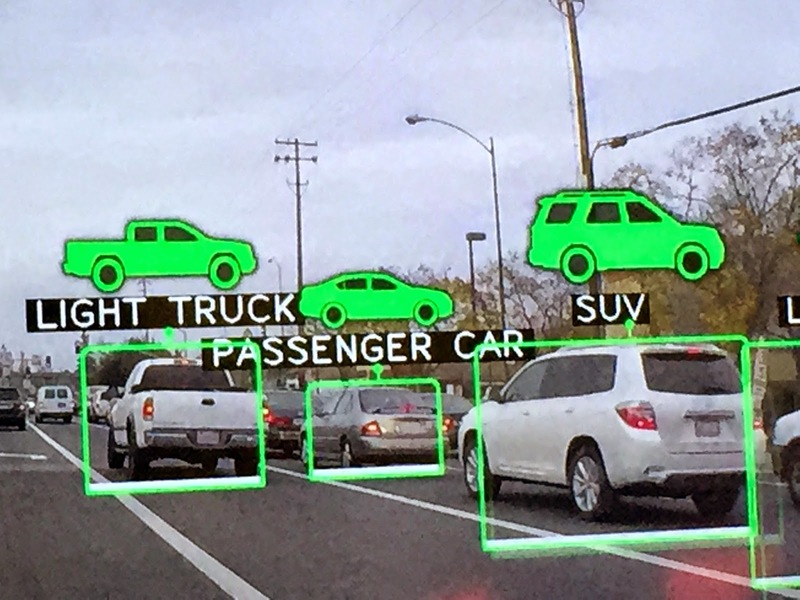 Nvidia’s smart recognition software (below) , that identifies types of cars in real time, definitely provided a Wow! moment. To leave on a positive note, there was one thing I thought was very cool, mostly because it resembled a science fair project: it’s called the Rockr2 and it’s a bluetooth enabled tube that has something that looks like half golf ball attached. The ball part emits vibrations and it able to turn everyday objects like empty cardboard boxes into speakers.